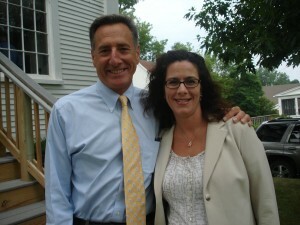 The Vermont Biosciences Alliance Co-Chair, Kimberly Murray, recently met with Governor Peter Shumlin to discuss the Exit 16 High Tech cluster. This could be an important economic driver for Chittenden county. As anyone who has attended a VBSA event at Albany College of Pharmacy off Exit 16 knows, localizing technology companies in ways that encourage human contact (lunch at Libby’s) and shared resources is a great opportunity supporting development of the Vermont biosciences industry.